Ages 4 through 8. 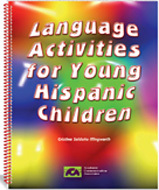 This book is designed to help speech-language pathologists, parents, special education teachers, and other professionals provide stimulating culturally and linguistically appropriate activities for Hispanic children. The activities will be especially useful in programs for students whose home language is primarily Spanish. The activities are designed to stimulate the development of basic concepts and listening skills that are critical for success in the early school grades. Each activity is included in both English and Spanish. 1. Learning Basic Concepts. The activities in this section strengthen children's understanding and use of basic concepts relating to color, size, shape, and quantity as they follow simple instructions. Familiar objects such as crayons, scissors, and paper cut-outs are used in the activities. 2. Answering Questions. The activities in this section provide opportunities for students to practice using language for a variety of purposes as they answer questions that begin with who, what, where, when, and how. 3. Following Directions. The activities in this section strengthen listening and auditory memory skills as students respond to verbal instructions that include a variety of basic concepts. 4.Listening to Paragraphs. The activities in this section require the child to comprehend and process spoken information contained within short paragraphs. After listening to each paragraph, the child responds to questions about what was said and retells the story in his/her own words. The student also demonstrates comprehension by drawing a picture showing what he/she heard in the paragraph. 5. Word, Sentence, and Number Repetition. The activities in this section require the student to repeat words, sentences, and number sequences. The activities build memory skills and help children to focus attention as they process auditory stimuli that become progressively more difficult. This book includes reproducible handouts in English and Spanish that can be helpful to parents in their efforts to stimulate language development at home. All of the worksheets in this book may be reproduced for use with students.